When Charla Parker retired as minister of music at Alva, First at the end of last year, it was the end of only one of the many things she has done since graduating from Grandfield High School. Parker and her husband, Larry, moved to Alva in 1971 where she taught music in the Alva public schools and he was speech pathologist at the junior high school. Parker graduated from Oklahoma Baptist University with a music education degree with an emphasis in organ and a minor in voice. She then taught school for five years in Berthaud, Colo. She and Larry, whom she met in Grandfield, married during her first year of teaching there. She finished her master’s degree at Colorado State University. They lived in Enid for one year while Larry attended Phillips University, and she taught 3-6 graders in Hennessey. The first Christmas they were in Alva, the pianist, who was pregnant, asked Parker to play for the church’s Christmas musical. After that, she became the full-time organist, and when the minister of music left, Pastor Jere Mitchell asked her to take over as interim. Since then, she has worked with five other pastors: Ron Argo, Preston Collins, Keith Barby, Buddy Hunt and present pastor Greg Hook. She said she never had any flack over being a woman serving as minister of music and if any of the pastors had any qualms about it, they never told her. She added she never felt out of place when she attended music week at Glorieta and was in the ministers of music class with 400 men and one or two other women. Parker led a full music program at the church, including adult choir, four handbell choirs, a men’s quartet and staffing children’s choirs, all while teaching full-time. She did retire from public school teaching about 10 years ago, but then spent five years doing adjunct teaching at Northwestern Oklahoma State University, where she also accompanied college choirs and senior recitals for instrumentalists and vocalists. In addition, she teaches private piano lessons, and now has 12 students. 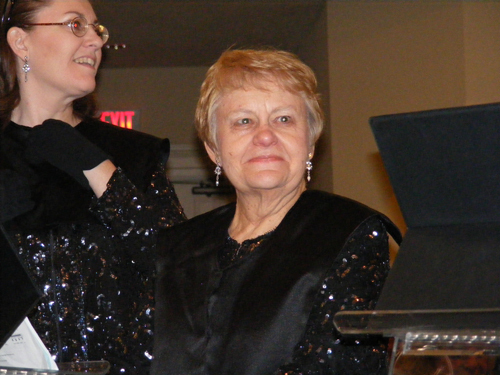 The church annually has special Christmas and July 4th musicals, and she led a community wide choir during the spring. “There are several churches in town that don’t have a choir, so we came together for a community-wide musical,” she explained. She also led a bell festival with the local Lutheran church the past three years. “We did it one year in our fellowship hall and the next in theirs,” she said. Parker said, with all the activities she has going, including teaching a college-age Sunday School class, the most important thing she did is prepare for worship. “I got the sermon topic the first part of the week and went from there,” she said. She said the church has a blended worship service, including choruses, but still uses the piano and organ. On a typical Sunday morning, Parker might get there early for a handbell rehearsal and men’s quartet rehearsal before teaching Sunday School, then leading the worship service. She said the music ministry has grown since she came. For example, there were no handbells at first. Parker now plays handbells with the Singing ChurchWomen of Oklahoma, where she has been a member for eight years. She traveled to Romania with the group in 2004. “Laura came to church with her sister,” remembers Parker. “They came from a bad home situation, and Larry told her if she ever needed a place to stay, to call. She called one Sunday night, and was with us since.” Laura, her husband and four children live in Rose Hill, Calif.
Parker, who has served on the BGCO board of directors twice, said she and Larry hope to travel and spend more time with their grandchildren in retirement. It’s going to be hard for the couple to have any time to themselves. They’ll have to work around Larry’s retirement activities of helping to coach the NWOSU football team, after coaching Alva High School football for 30 years, and his job as a certified massage therapist. The couple has a 14-day motorcoach trip planned for next June-if they can work it in.